​Most people know that rats are very intelligent and interactive animals. In the wild they would spend lots of time searching and getting there food. This means they have developed very good problem solving skills and are very capable of defeating many obstacles to get there dinner. Our domesticated rats are not that different from there wild counterparts in this. Studies have shown that lab rats offered the choice of easily accessible food and food they have to work for will actively seek out the harder to get food. Not only does it help challenge and keep them stimulated, they actually enjoy it too. This being the case there is a lot of opportunity and benefit for us as owners to use food as more than just a means of meeting the nutritional requirement. This is where feeding for enrichment comes in. There are many different ways to do this, and if you have rats who have never had to work for their dinner before it might be worth taking things a little bit slowly, starting with scatter feeding in a limited area before adding in more difficulty and challenge. Below is a summary of some of the many ways to make the most of feeding your rats and rank them according to the challenge they present. Start with one or two easy methods before trying the harder ones, and don’t feel limited to just those below, your imagination is probably more limited than your rats ability to work things out. Just a warning, it’s a slippery slope and once the rats are used to problem solving they become even harder to keep out of/away from things (which can help keep us humans nicely challenged). What is it: This is scattering your rats food around the cage, it allows the rats to properly forage for their dinner, encouraging searching and some digging. 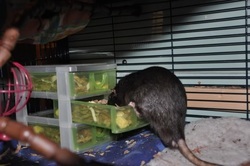 Why: Foraging is a very natural ratty behaviour, it takes more time than going to a bowl or stash. This form of feeding can also help limit food passiveness (food is not in one place so hard to guard), even out weight in a mixed weight group (it favours the more active rat and stops one rat living by the food bowl), encourages activity and curiosity and is enjoyable for them to do. You can scatter feed fruit, veg and even many wet foods too. What is it: This is a much deeper form of scatter feeding, and can be useful if you have a cage with a “carpet” rather than proper substrate. It offers the rat a nice deep layer of objects or digging material to search through for their dinner. Why: By offering extra depth to the rats you allow them to properly dig, this is a very natural behaviour for a species who often live underground and in tunnels in the wild and is a good form of exercise (as well as a lot of fun for animals who love to make a mess). It also allows you to offer digging and foraging opportunities if you don’t use substrate, though it is beneficial even if you do. 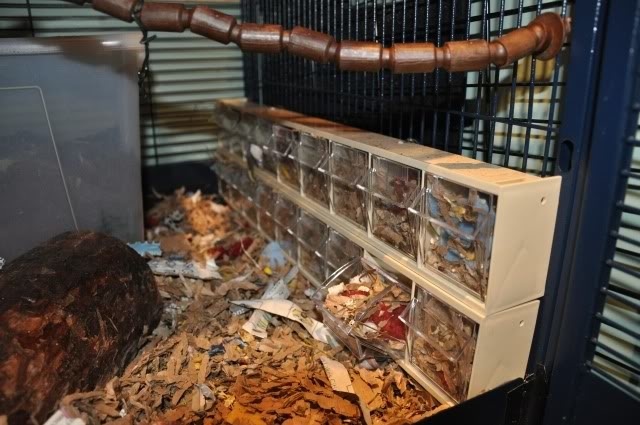 How: The first step is to decide if you want this in the cage or out (say in the free ranging area), this will very much determine the size and also possibly the contents. Once decided then find a decent depth plastic tub you can use, it’s nice if it’s transparent so you can use it. Something around 30-40cm deep minimum is good. Ideally if you plan to use a messy filling you also want something with a lid that can be fitted. Cut a rat sized hole in the lid and it should stop most of the filling being excavated outside the box. Then it’s a case of picking a good filling, for maximum digability a 60:40 mix of potting compost and sand is good, as is reptile coco fibre bedding, however if left too long these can end up growing any seeds the rats have missed (not necessarily a bad thing) and also can attract tiny flies in warmer weather. Changing the filling regularly does prevent this. Another option is to use a deep layer or your normal substrate; I find hemp is particularly good as it moves around well, but is also quite messy. You could use shredded paper, hay or even shredded cloth too, though I found my rats nested in there with material filling. Once set up start sprinkling some of their daily food allowance in there and add rats. You can bury it deeper as they get used to the idea. A nice option, especially for a free range area, is to collect “interesting things” like ping pong balls, children’s plastic toys, clean shells and small pebbles, parrot floor toys and so on. This makes a very enriching selection of shapes to sort through and is also usually washable. 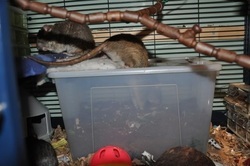 Compost and coco fibre can get your rats tails very grimy so best avoided in the weeks leading up to a show. It doesn’t tend to stain rats much though. When using a soil type fillings rats quite like a solid surface to dig from, say a piece of tile or flat pebble. What is it: This is where you hang food around the cage, this is ideally out of easy reach and can be made harder by hanging in awkward places where rats have to climb or balance to reach. Why: By moving it out of easy reach you encourage climbing and slow down the rate of eating. It provides motivation for the rats to exercise more. How: This does depend on your rats physical ability. 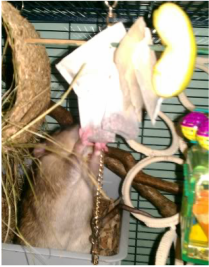 For rats who are not very fit and active starting by attaching only a few inches above floor level, for fitter rats try hanging from the ceiling, or in an awkward hard to reach corner (if high up a catch hammock underneath or a thick layer of bouncy substrate work well). Thick green garden wire works well as they can’t easily chew through it, though string or thinner wire can work well. Foods best suited to it are largish solid food which rats can gnaw relatively easily but isn’t too quick to eat of like a whole carrot, corn on the cob, a dog treat etc. You can make interesting ratty garlands by threading easier to eat foods on strings across the cage, say cabbage leaves, mushrooms or popcorn. You can buy “kabob” sticks which are a bar which you can thread fruit/veg on and then hang from the ceiling which can work well. Alternatively trip the point off a wooden BBQ skewer and use string or wire to suspend from the roof or thread through the corner bars horizontally and have a DIY version. You can get hanging cages which work well for different types of veg (especially leafy) or use bird food hangers, you can even make your own from wire mesh, just watch the sharp bits are tucked away/filed. What is it: This involves wrapping or boxing up food so the rats have to tear through or gnaw holes to get to the content. How: There are lots of options for doing this from simply wrapping some food up in scrunched up paper, or putting it in left over cardboard boxes. Difficulty is increased with thicker cardboard, better sealing and more layers. To seal try tying up with string or using a none toxic tape like duct tape or masking tape. This method is particularly successful with foods that come in mall pieces, say peas, dried food, seeds, kibble etc. Create ratty Christmas crackers by using an empty toilet roll tube, stuff with dry mix and treats, scrunched up tissue paper, some dried edible leaves and anything else exciting, cover the outside in a sheet of paper and twist or tie the ends to create a cracker shape. If your rats aren’t getting the hang of it poke a few small holes in and try boxing something that smells strongly, this should get them interested. What is it: There are a wide range of well-designed and solid parrot foraging toys out there. They are usually not particularly cheap but last well as they are typically Perspex and made to withstand a parrots beak. This come in a number of formats but the most applicable to rats are those that involve manipulation of objects (rolling something around or shaking it, opening doors, sliding out drawers or spinning objects) to get to the food. Why: These really test a rats ability to work out how to solve a problem as well as encouraging manual dexterity. The range in difficulty allows you to build up their ability to test and try different solutions, and rotating a few keeps the group using different skills. 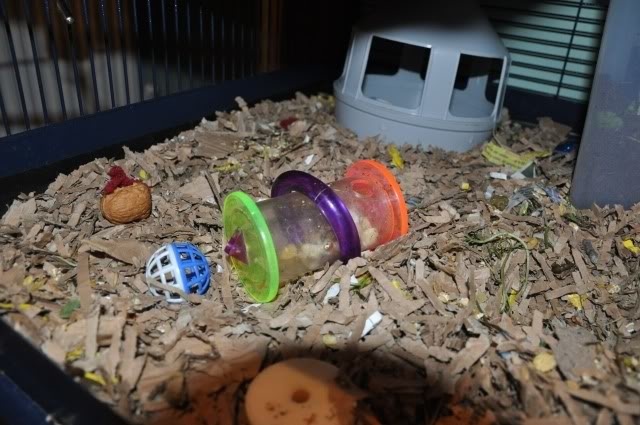 How: Its worth leaving these kind of toys until you rats are a little bit more used to working for their food, then start with simple motions such as knocking something around or rolling it. Once they are familiar with this introduce sliding drawers which they seem to get relatively quickly, then maybe lifting, pulling or rotating objects. Add a small amount of their daily dry mix to these objects and rotate regularly (or only give every few weeks or so) so they don’t become too good at it. Look for small hobby/garage drawers and fill these with paper/substrate and a bit of food. Get a small tough plastic bottle, drill/poke a few holes in it and add a bit of food in it and close the lid, this makes a good rolling food dispenser. Look out for dolls house furniture, some of these make excellent rat puzzles as long as they are tough and don’t have any loose bits.